If you have a can of lemon-lime soda and a carrot, you have the beginning of an unexpected side that’s perfect for a busy week night or an elegant meal. As a lover of vegetables, it doesn’t take much for me to eat my veggies. A recent trip the farmers market in Charlotte lead to long conversations over the different types vegetables from India, how they look, and how to cook them. Any who…back to the carrots and soda. If you love glazed carrots, but you never master the art of the perfect sugar or honey ration to water, lemon-lime soda is the answer! 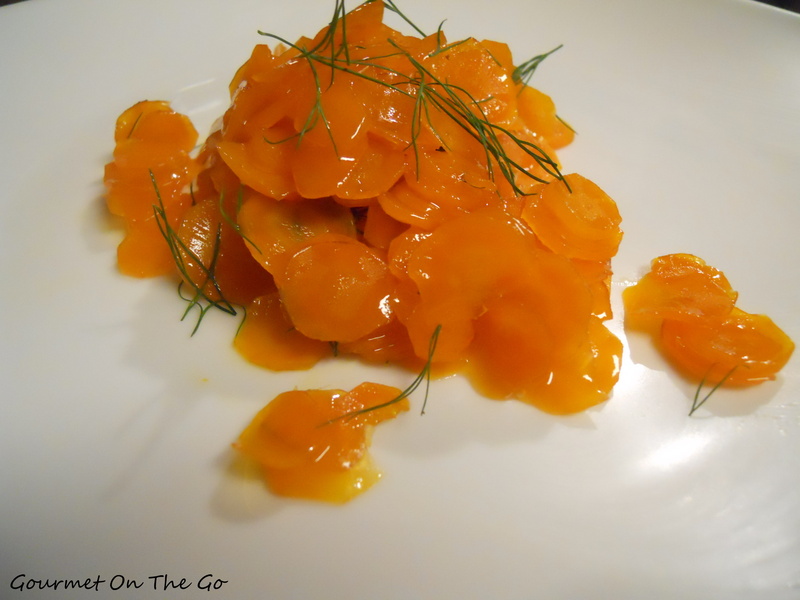 Take a peek at this gourmet recipe made easy and leave your comments! Enjoy! Slice the carrots uniformly to promote even cooking. I prefer a mandolin, yes this is one of my favorite kitchen tools ♥. In a medium sauce pan, add the carrots and lemon-lime soda over medium-high heat cover and bring to a boil. Reduce the heat and continue to eat for 10 minutes. Uncover the pan and continue to cook until the carrots are tender and the liquid is almost evaporated. Add the butter stir until melted and add seasons. Salt and pepper to taste. 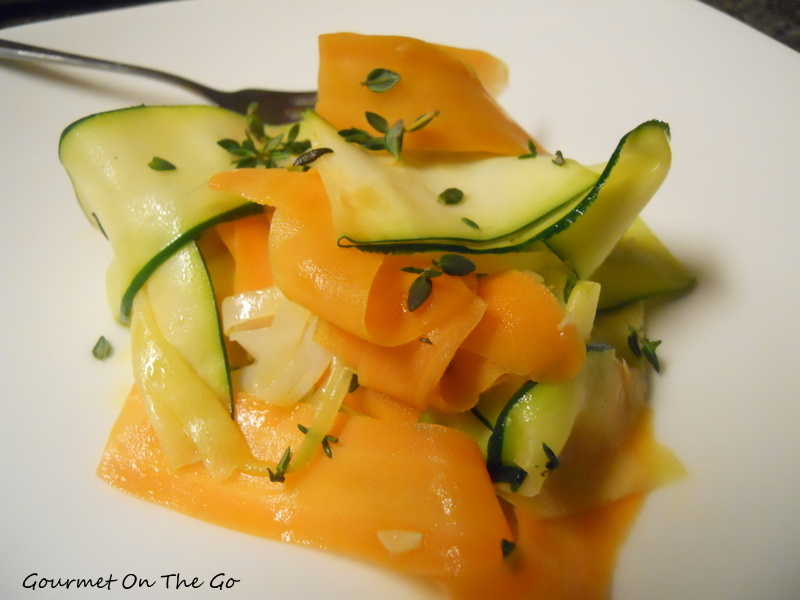 Shave the zucchini and carrot into ribbons using a vegetable peeler to make long thin strips. A mandolin may work but it’s more difficult to control the thickness of the strip. Heat a medium saute pan over medium high heat and saute the leek in the butter and olive oil mixture for 1 minute. Add the zucchini and carrot and continue to cook for 3 minutes. Remove the pan from heat and toss the vegetables with the thyme and the fresh lemon juice. Serve immediately. So just an FYI about me, I don’t like left-overs! I know I know…this fact goes against being American, but I can’t help it! 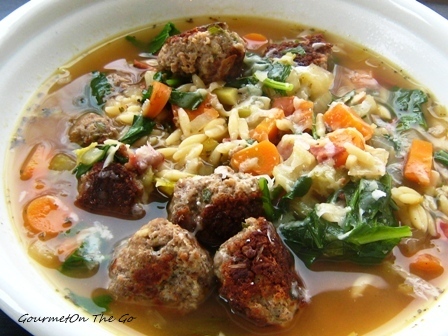 The only thing I hate more that left-overs is fast food, so on days when work has put me in a pinch, this Italian Wedding Soup is just the thing I need to keep me out of the drive-thru! Melt the butter in a large soup pot over medium heat. Add onions, carrots, garlic, salt and pepper and cook until translucent and fragrant, about 4-6 minutes. Stir in broth, tomatoes, and 2 cups water. Cover and cook 10 minutes over medium heat or until soup comes to a boil adding the meatballs. Add the orzo to the boiling soup and stir. Orzo should be fully submerged. Cover and simmer for another 12-15 minutes over medium heat. Stir in spinach. Test a meatball ensure it is warm through. Test a piece of orzo, the pasta should be al dente. Taste and adjust seasoning. Serve immediately! Melt the butter in a large soup pot over medium heat. Add onions, carrots, garlic, salt and pepper and cook until translucent and fragrant, about 4-6 minutes. Stir in broth, tomatoes, and 2 cups water. Cover and cook 10 minutes over medium heat or until soup comes to a boil adding the meatballs. Add the orzo to the boiling soup and stir. Orzo should be fully submerged. Cover and simmer for another 12-15 minutes over medium heat. Stir in spinach. Test a meatball ensure it is warm through. Test a piece of orzo, the pasta should be al dente. Taste and adjust seasoning. Serve immediately. Serves 6 with a nice crusty bread! Food is my true PASSION! As a personal trainer, eating healthy is important and using fresh ingredients is also a BIG focus for me. I spent many hot summer days sitting in the backyard as a little girl making mud pies with wild onions and dandelions and now I create wonderful meals for family and friends using fresh ingredients and a gourmet flare.I'm a mother of 2 college aged kids with a chance to turn my passion into a second career. Thank you for letting me share my passion with you! Please enjoy the recipes and leave your comments!